Mezzo-soprano Ginger Costa-Jackson is Carmen in San Diego Opera’s CARMEN, March/April, 2019. Photo by J. Kat Woronowicz. There’s not too much to say about R. Keith Brumley’s utilitarian scenic designs for San Diego Opera’s production of Carmen which began a four-performance run last night in Civic Theatre. They’re far from spectacular and not especially evocative of the beautiful city of Seville in sunny Spain. Some people, of course, are drawn to opera expecting to “really see something.” But when everything else clicks in the pit and on stage, what does that matter? I have seen Carmen more times than the philosopher Friedrich Nietzsche whose favorite opera this was. He had not tired of it after 20 performances and touted its superiority over all the the works of Wagner. I wouldn’t go that far, but I cannot remember enjoying Carmen more than I did last night. First of all, there is mezzo-soprano Ginger Costa-Jackson who is positively sensational in the title role. She possesses an astonishing voice and she shapes everything in the music into something entirely her own. She is highly conscious of the meaning of the words, the mark of an exceptional singer and actress. Her lower register is rich and creamy and she occasionally ventures way upward to surprisingly dramatic effect. No other Carmen I have ever heard sounds exactly like her. Nor looks like her. She projects a volatile, sensual character — playful and dangerous, yet somehow sympathetic. She is at once a femme fatale and a liberated woman. Today it’s difficult not to see the entire opera in terms of our heightened collective consciousness with regard to feminism. Except for Don José’s sweetheart, Micaëla, Bizet’s women are a sketchy bunch, quarrelsome and, in the cigarette factory, engaging in ridiculous catfights that are supposed to be comical. As for the gypsies — to this day they are marginalized and regarded as untrustworthy and as thieves and sexual degenerates. Costa-Jackson makes us aware of this context but rises above it to individualize her character brilliantly. While attending an opera, critics usually refrain from public displays of displeasure or extreme enthusiasm — a somewhat silly unwritten code, I suppose, to enhance our imagined mystique or to keep from influencing other “civilian” opera-goers. We are to remain impassive. But I could not resist shouting “brava” after hearing soprano Sarah Tucker perform Micaëla’s third act aria, “Je dis que rien ne m’épouvante”, a part of the opera I usually detest. It’s saccharine and slows down the action during a long evening. Indeed, I have often wished for the total excision of that usually dreary character from the opera. But if Sarah Tucker is singing it, every note is something special. She has one of the loveliest soprano voices I have heard in years and she brings great depth of feeling to a part that is so often tedious. 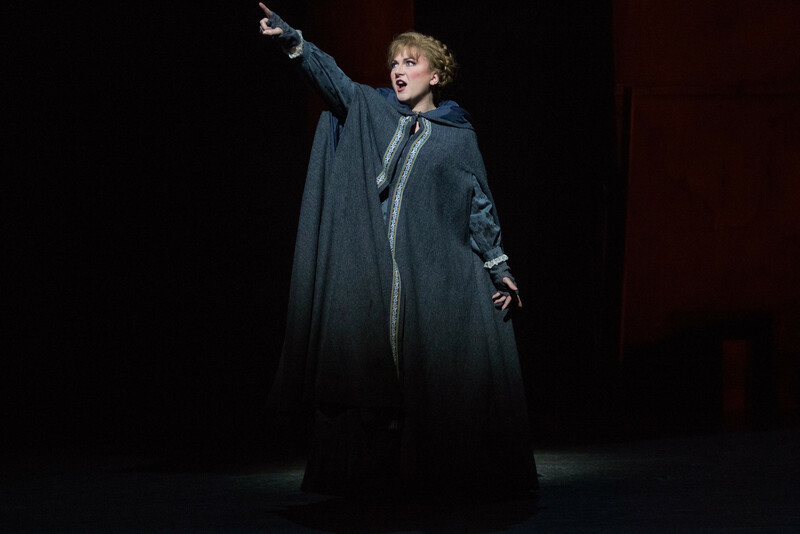 Soprano Sarah Tucker is Micaela in San Diego Opera’s CARMEN, March/April, 2019. Photo by J. Kat Woronowicz. The problem with Micaëla, of course, has to do with her goody-goody function in the story, relaying mother’s kisses to the dragoon Corporal Don José, the most notorious Oedipal mama’s boy in all of opera. I can never quite get the Oscar Hammerstein II lyrics for the Act One José/Micaëla duet out of my mind: “You talk jus’ like my maw / You even walk jus’ like my maw / An’ I know why I’m stuck on you / It’s ’cause I’m jus’ like my paw!” This is the all African-American Broadway musical Carmen Jones, my first introduction to Bizet’s music. The original duet which begins after “Parle-moi de ma mère!” is usually a gummy musical stretch, but so lovely when sung by Tucker and last night’s José, tenor Robert Watson. Watson has a big masculine baritonal sound which gained in strength throughout the evening and was especially forceful in the über-violent staging of Carmen’s murder in the last act. His second act “Flower Song” (“La fleur que tu m’avais jetée”) was not as successful for him as he could have wished, because he had a little difficulty transitioning into the beautiful high head tone voice near the aria’s end. But all in all, he was a very fine Don José, alternately vulnerable and wildly out-of-control. Tenor Robert Watson is Don Jose in San Diego Opera’s CARMEN, March/April, 2019. Photo by J. Kat Woronowicz. It must be said that as the dashing Escamillo, impressive basso Scott Conner didn’t look too much like an authentic matador, but he was full of aggressive swagger and forced charm — giving the overall impression of being a little too eager to please. His is a big voice, but in French, it has a curiously hollow sound to my ears. An accomplished artist, he has sung everything under the sun already everywhere in the world, but he seemed uneasy as Escamillo. Not an ideal role for him. The other so-called smaller roles were wonderfully filled — and all the choral work, of which there is lots in Carmen, was really excellent. Bruce Stasyna is the effective chorus master. One of the great highlights of the Carmen score is the fleet and fabulous and throughly French quintet sung by Carmen, her gypsy pals Frasquita and Mercédès, and the smugglers Dancaïre and Remendado. There was wonderful work by soprano Tasha Koontz (Frasquita) and mezzo Guadalupe Paz (Mercédès), and baritone Bernardo Bermudez (Dancaïre) and tenor Felipe Prado (Remendado). 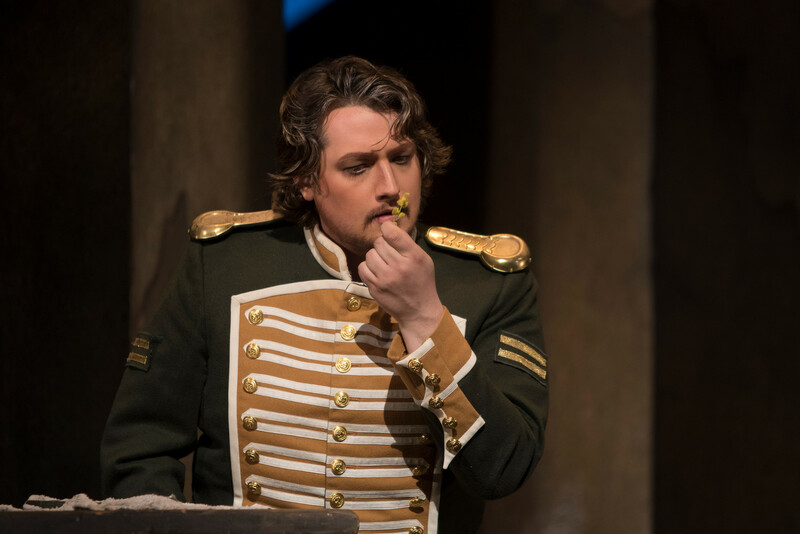 Elsewhere in the opera, bass-baritone Patrick Blackwell was imposing as Lieutenant Zuniga, and baritone Brian Vu made for a highly appealing Moralés. Great casting! 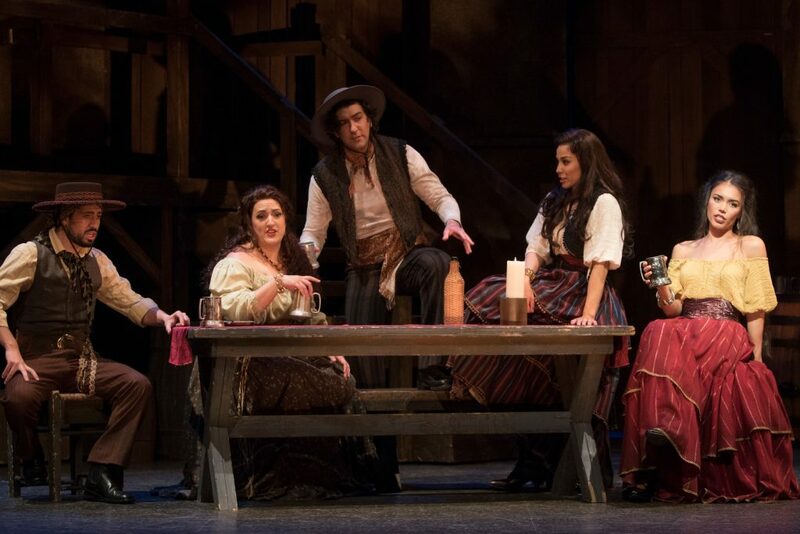 (L-R) Tenor Felipe Prado is Remendado, soprano Tasha Koontz is Frasquita, baritone Bernardo Bermudez is Dancairo, mezzo-soprano Guadalupe Paz is Mercedes, and mezzo-soprano Ginger Costa-Jackson is Carmen in San Diego Opera’s CARMEN, March/April, 2019. Photo by J. Kat Woronowicz. 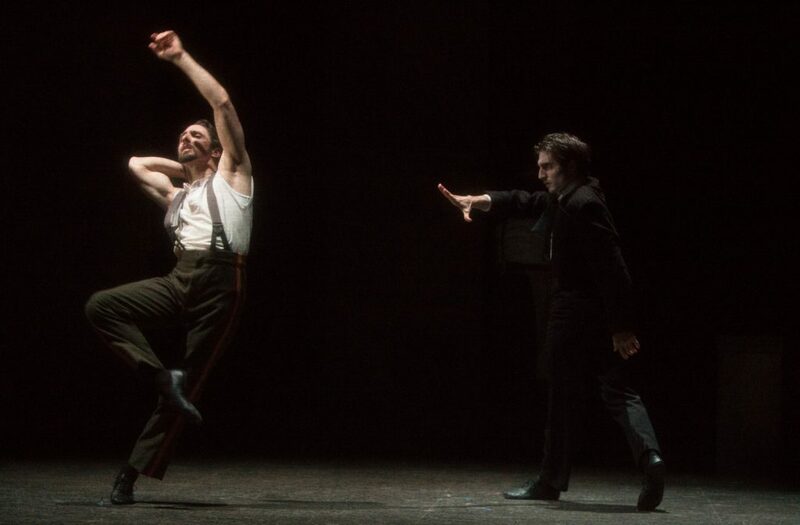 One thing that makes this Carmen special is the deft employment of two magical dancers who manage to convey the struggle between the two male protagonists of the story. Balletic enrichments of this sort are not always successful — but it seems stage director Kyle Lang is also a choreographer. The superb dancers were Laurence Gonzalez and Lester Gonzalez. There were times I felt Lang’s stage direction was a little off (some group entrances in Act One, for instance, and character exchanges oddly stretched out over the stage) — but overall he achieved an effect of dramatic intimacy, not something one always associates with grand opera. The drama was upfront and compelling. One did not really miss huge crowds and marching fighters in the Act Four bullring scene. If the sets were not too thrilling to look at, Chris Rynne’s lighting designs made up for it. There must have been a million cues so that things always looked interesting. The costumes were also excellent — for which we must thank designer James Schuette. The photos here at Opera West speak louder than words. This Carmen was the through-composed version, by the way, without all the original Opéra-Comique spoken dialogue which has been become trendy. The recitatives were composed by Ernest Guirard who rarely gets any credit. The San Diego Symphony offered up a vigorous reading of the familiar score under the exceptionally capable direction of Yves Able. 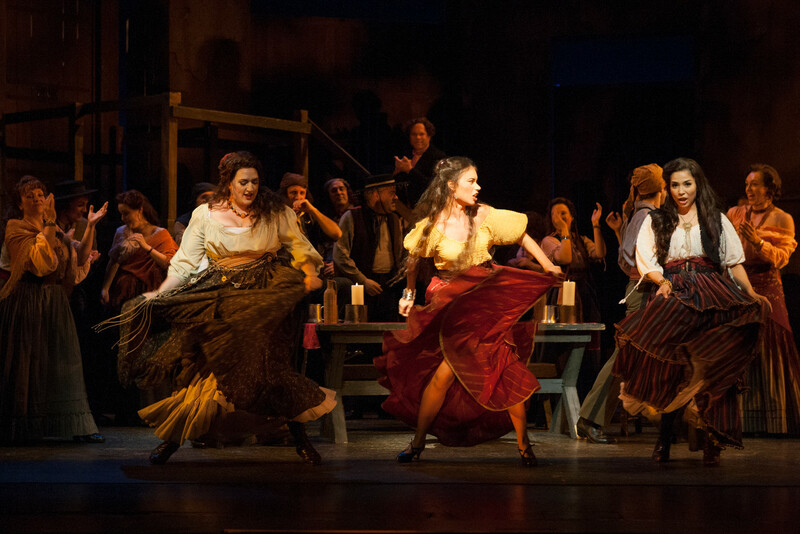 L-R) Soprano Tasha Koontz is Frasquita, mezzo-soprano Ginger Costa-Jackson is Carmen, and mezzo-soprano Guadalupe Paz is Mercedes in San Diego Opera’s CARMEN, March/April, 2019. Photo by J. Kat Woronowicz. I noted that the program contains an essay by John Willett, my predecessor as classical music critic at San Diego Magazine. John died in 2001. And I long ago stopped reviewing at the magazine — but this blog is a offshoot of its online website. Principal dancers Laurence and Lester Gonzalez in San Diego Opera’s CARMEN, March/April, 2019. Photo by J. Kat Woronowicz. 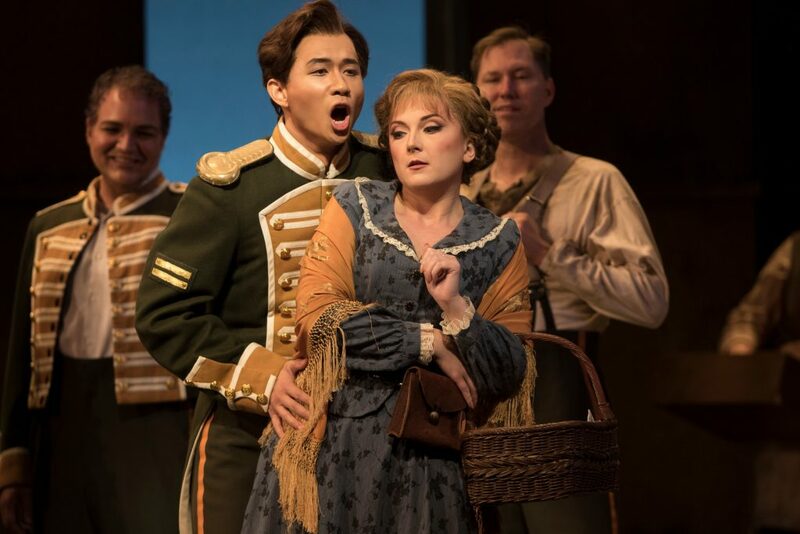 Baritone Brian Vu is Morales and soprano Sarah Tucker is Micaela in San Diego Opera’s CARMEN, March/April, 2019. Photo by J. Kat Woronowicz.